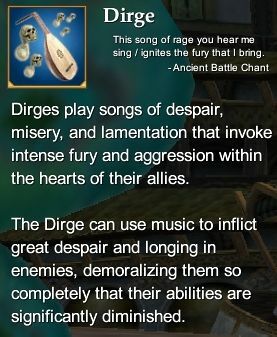 From the Everquest 2 player manual: The Dirge is an ideal profession for those who desire to use songs of misery and sorrow to inspire intense battle rage in their allies and despair in their enemies. The Dirge best serves his party behind the frontlines where he can play mournful songs behind the protection of his allies. The Dirge's songs inspire bold feats in allies, boosting their attributes and skills, and demoralize enemies, diminishing their strength in battle. Agility (primary) - Increases your damage and maximum power. Dirge Epic Weapon Timeline (80) - Rise of Kunark Dirge Epic Weapon. This page last modified 2011-08-25 22:52:03.